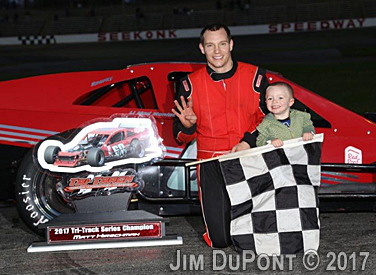 With sparks flying, Matt Hirschman of Northampton, PA, made a clean sweep of the 2017 season in Tri-Track Open Modified Series (TTOMS) competition; winning the Haunted Hundred at Seekonk Speedway on Saturday, October 28, 2017. Hirschman took home $6,000 for the win plus the ‘bounty bonus’ of $1,500. Having already secured the championship for the series, the win was the capper to a dominating season; where Hirschman went 4-0. While Hirschman dominated all season, he did not do so during the Haunted Hundred. At the end, Hirschman earned the victory over hard-charging Anthony Nocella from Woburn, MA, and Rowan Pennink of Huntingdon Valley, PA. Richard Savary and Les Hinckley rounded out the top five. A wild finish in the Late Model Haunted 50 found Seekonk speedway’s 2017 Late Model champion Ryan Lineman of Coventry, RI in victory lane. Tommy Adams of E. Providence, RI, Dan Johnson, Rehoboth, MA, Ryan Morgan, Ledyard Center, CT; and Jake Johnson of Rehoboth, MA, completed the top five. Derek Gluchacki of North Dartmouth, MA, took home top honors in the Legends cars. Complete race reports for the Late Model and Legends is available on SeekonkSpeedway.com. Under picture-perfect weather conditions, Ron Silk led the field to green for the start of the Haunted Hundred. Silk jumped out to the early lead with Steve Masse in tow. The remainder of the field went two-by-two in the opening laps. After heat race qualifying, Matt Hirschman was mired mid-pack in the 14th position. The lead duo drove away from a heated battle between Tommy Barrett and Pennink. Derek Ramstrom and Nocella went wheel-to-wheel followed by a tight pack that also included Russ Hersey and Ryan Preece. Barrett finally freed himself of Pennink but not before Silk and Masse had amassed a half straightaway lead over the rest of the pack. Pennink and Nocella began to fade on the outside groove losing positions to Ramstrom, Hersey and Pitkat. Ramstrom began to work over Barrett for third. The first caution of the event flew on lap 15 when Pitkat spun with a flat right rear tire. The top-five at the time of the caution was Silk, Masse, Ramstrom, Hersey and Barrett. Hirschman was not making much progress during the opening laps. On the ensuing restart, Silk was able to retain his lead. Looking racy after the restart, Masse made a bid for the lead; diving low coming out of turn four. The two made contact. Masse was unable to save it; losing the handle and spinning in front of the entire field to bring out the second caution on lap 17. A number of good cars were collected including Vinnie Annarummo, Bobby Santos, Keith Rocco and others. Annarummo and Santos were not able to rejoin the competition. Preece, Nocella and Savary pitted under caution. Silk had to contend with Hersey on the restart on lap 17. Hirschman now ran in eighth. A great launch by Silk gave him the lead once again. Ramstrom capitalized from the bottom groove to grab second from Hersey. Hersey was able to duck in line into third but was not content to settle. Jumping to the inside of Ramstrom, he was able to take the spot away once gain. Pennink ran in fourth ahead of Barrett who was getting heavy pressure from Jonny Kievman. A lap late, Pennink got around Ramstrom to run in third. Kievman stormed by Barrett taking Matt Galko along for the ride. Hersey looked low on Silk coming out of turn four, making the pass stick to become the new leader on lap 29. Barrett continued to backslide losing positions to Galko and Hirschman. Pitkat, after changing a tire, ran ninth. A single car spin for Richard Savary had the caution flying. A lap 29 restart attempt was called back with a warning issued to Silk. On the second attempt, the lead duo went wheel-to- wheel. Silk stayed to the outside for a single lap before settling into second behind Hersey. Hersey was not getting any breathing room over Silk. Pennink, in third, was dogged by Kievman. Hirschman broke into the top five grabbing a position from Ramstrom when back under green. With the top eight running single-file, the best battle on the field was for ninth between Pitkat holding off the charges of Galko, Hinckley and Max Zachem. Galko slid up the track moving Pitkat and opening up the door for both Zachem and Hinckley. After scuffling for positions, Hinckley ran ahead of Zachem, now Nocella, Galko, and Pitkat. Chris Pasteryak was joining the fray. Recovering nicely from earlier incidents, Masse and Savary found themselves knocking on the door of the top-ten. Hersey had run out to a sizeable lead as the race hit the halfway marker. Silk ran in second over Pennink, Kievman and Hirschman inside the top-five. Positions fifth through tenth at halfway were Ramstrom, Pasteryak, Hinckley, Nocella and Zachem. Just as Hirschman was putting the pressure on Kievman, a spin by Preece brought out the fourth caution at lap 55. Under the caution front runners Ramstrom and Silk headed to pit road for service. On the lap 55 restart, Hersey was able to maintain his lead over Pennink. A few laps later Hirschman, who had made his way up to third, was able to take second from Pennink. He immediately took chase of leader Hersey. Kievman, stuck on the outside groove, was shuffled back; giving up positions to Pasteryak, Nocella, Savary, and Hinckley. Upfront Hersey was able to maintain a two car-length advantage over Hirschman. Nocella and Savary were able to get by Pasteryak before the fifth caution flew on lap 67 for an incident with Preece and Blake Barney. Pasteryak lost ground in the shuffle as well. Pitkat was penalized for the contact with Preece. On the lap 67 restart, Hersey had to contend with Hirschman for the lead. After a bit of contact, with the two bumping wheels, Hersey was able to regain the lead. Hirschman hunted Hersey for the lead - first looking high for an advantage and then low - but to no avail. At lap 75, Hersey was hanging on over Hirschman with Pennink, Nocella and Barrett inside the top-five. Savary, Hinckley, Rocco, Masse and Andrew Krause made up the top-ten with 25 laps to go in the Haunted Hundred. The battle for the lead ramped up once again on lap 78 with Hirschman diving low looking for running room underneath the leader. Hersey was able to fend off the advances once again. Hirschman continued to dog Hersey for the lead. Nocella meanwhile was able to slip by Pennink for third. The sixth caution of the event flew on lap 90 when Blake Barney slowed; setting up a 10-lap dash to the checkers. Hersey had been retaining a single car length before the caution flew. The yellow however would prove to be the undoing for Hersey. On the lap 90 restart, the lead duo went side-by-side for the lead. Nocella looked to make it three-wide for the lead as Hersey drifted up. With the opening, Nocella dove low. The two made contact that sent Hersey spinning into the infield. No other cars were collected. Hirschman was the new leader for the second attempt at a lap 90 restart. Nocella was lined up to his outside with Pennink and Savary in row two for the restart. Hirschman easily took the top spot; maintaining a single car length advantage over Nocella. Hinckley, who had moved into fourth over Savary, pursued Pennink. With three laps to go, Nocella gave it his all in pursuit of the victory and the $1,500 bounty to beat Hirschman. The two made contact on lap 98 with Hirschman keeping the lead. Sparks flew from contact between the two coming out of turn four on lap 99. Hirschman stood his ground, withstood the onslaught and went on to win the Haunted Hundred. After a valiant and exciting effort, Nocella had to settle for second. Pennink hung on for a podium finish. Hinckley and Savary completed the top-five at the checkers. Earlier in the month, officials of the Tri-Track Open Modified Series had announced a bounty on Hirschman. Any competitor who could dethrone Hirschman in the Haunted Hundred would receive a $1,500 bonus. If Hirschman out-dueled the competition yet again, he would take home the $1,500 bonus. The $1,500 bounty bonus was added to Hirschman’s winners share; making his total take for the event to $7,500. The victory was the fourth in four starts of the 2017 TTOMS season for Hirschman. He won both events at Seekonk and both events at Star Speedway. October 28, 2017: TTOMS Official Finishing - Haunted Hundred - Seekonk Speedway: 1. Matt Hirschman, Northampton, PA; 2. Anthony Nocella, Woburn, MA; 3. Rowan Pennink, Huntingdon Valley, PA; 4. Richard Savary, Canton, MA; 5. Les Hinckley, Windsor Locks, CT; 6. Steve Masse, Bellingham, MA; 7. Andrew Krause, Holmdel, NJ; 8. Keith Rocco, Wallingford, CT; 9. Ron Frees, Brick Township, NJ; 10. Chris Pasteryak, Lisbon, CT; 11. Colbey Fournier, Berkley, MA, 12. Max Zachem, Preston, CT; 13. Derek Ramstrom, West Boylston, MA; 14. Woody Pitkat, Stafford Springs, CT; 15. Jon Kievman, Deerfield Beach, FL; 16. Matt Galko, Meriden, CT; 17. Ron Silk, Norwalk, CT; 18. Russ Hersey, Swanzey, NH, 19. Tommy Barrett, Millis, MA; 20. Kirk Alexander, W. Swanzey, NH, 21. Ryan Preece, Berlin, CT; 22. Ryan Vanasse, Warwick, RI; 23. Blake Barney, Lakewood, NJ; 24. Vinnie Annarummo, Swansea, MA; 25. Bobby Santos, Franklin, Ma; 26. Kurt Vigeant, Oxford, MA. DNQ: Mike Holdridge, Madison, CT; Rich Parker, Forked River, NJ; Nick Salva, Cheshire, CT; Rob Richardi, Taunton, MA; Cam Sontag, Sterling, MA; Karey Stular, Ardrossan, AB, Canada; Ryan Doucette, Framingham, MA; Sal Accardi Jr., Deer Park, NY; Andy Jankowiak, Tonawanda, NY; Walt Sutcliffe, Panacea, FL; George Sherman Framingham, MA..